When Alter announced a Hobby Japan-exclusive version of Hyakka Ryoran heroine Yagyu Jubei clad in revealing swim attire, it didn’t take long for me to decide that Jubei was a character worth at least two figures. Acquiring this version of Jubei was made complicated by the details accompanying the release announcement. Beyond the simple fact that Hobby Japan won’t ship outside Japan, Jubei was also to be limited to 1,500 pieces distributed via lottery. It seems that the old “first-come, first-served” adage need not apply here. The lottery clause effectively eliminated the option of ordering the figure through a proxy service because there was no guarantee that they could fill the order. I had noticed in the past that the US-based ToysLogic seemed to carry Hobby Japan exclusives from time to time. I contacted them regarding the new Jubei to see if they would be accepting orders. A few days later, I got a response that they would indeed be accepting orders for the HJ exclusive. I was concerned as to how they would get around the lottery problem, but I didn’t press the issue and decided to place my order through them. A box from ToysLogic arrived at my doorstep seven months later. Alluring pose — Clearly, the essence of this figure is in the presentation. Jubei is seen leaning forward suggestively with one of her two swords sandwiched tightly between her breasts. This pose is ridiculous and appealing in the same way that a chain-mail bikini is in a fantasy RPG. I suppose if you’re one of those people who believe armor should be strictly functional, then there’s really nothing for you here. For the rest of us, we can get our “girls with swords” fix and a little extra skin, too. 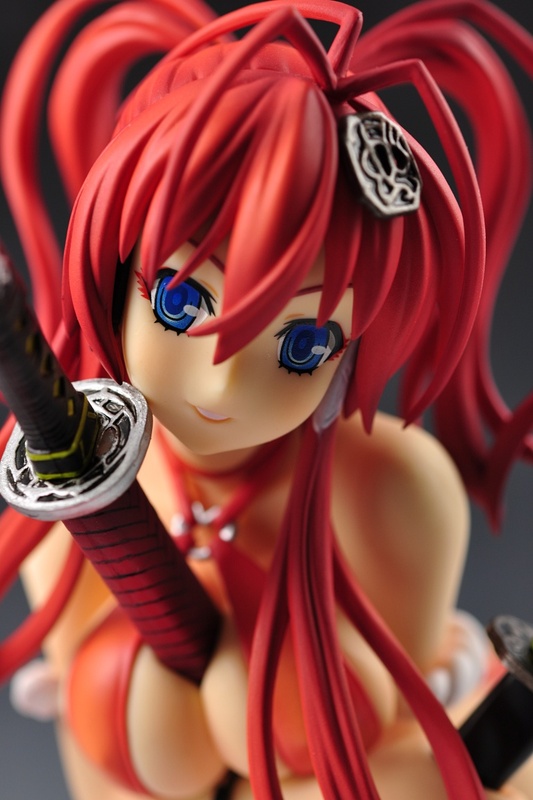 Quality you’d expect from Alter — Alter pretty consistently delivers a quality figure and they continue to do so here. The paint and sculpt work aren’t particularly remarkable other than the fact that they meet my expectations based on Alter’s past (good) work. There was some concern based on the pre-release photos, as noted by others, that the hole through Jubei’s cleavage where the sword goes looked rather poorly done. The final version looks fine, IMO. No problems here. Finally, a swimsuit figure that doesn’t disappoint! — This is a bit of a personal note, but my previous purchases in the swimsuit genre have been largely disappointing. First, there was Yamato’s 1/8-scale Aoyama Motoko from Love Hina. She was my first figure purchase ever. At the time, I appreciated the figure for what it was. But as I began to collect more figures, it became obvious that the Yamato figure simply wasn’t a great quality figure. They used multiple pieces of plastic to create Motoko’s bangs and it looked horrible on close inspection. They also required a plastic support rod to hold Motoko upright for a very basic standing pose that should never have required a support in the first place. I would end up selling this figure several years later. Next, there was Alter’s 1/8-scale Sawachika Eri. I thought she looked good in the pre-release photos, but something that I saw there didn’t translate into the final PVC. It’s difficult to describe why I didn’t like this figure, but I felt like the figure looked flat and dull. Like Motoko, ended up selling my Eri after a year or two. Finally, there’s Kotobukiya’s 1/6 Corticarte Apa Lagranges. I still have this figure and hope to do a review at some point. Suffice it to say that using real cloth instead of plastic for Corti’s bikini sounds better in theory than it works in practice. 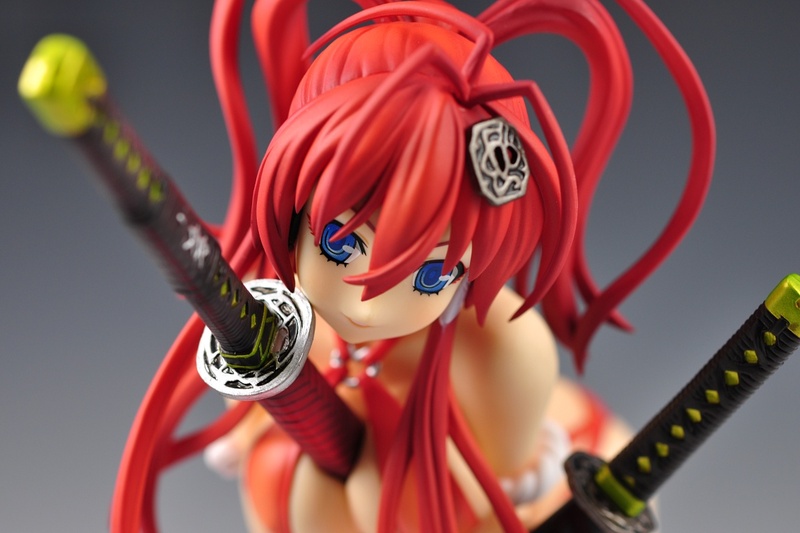 Hobby Japan exclusivity — This version of Jubei was a Hobby Japan mail-order exclusive item. Additionally, she was supposed to be limited to 1,500 pieces distributed via lottery. In general, I dislike “exclusives” because I see them as a way for companies to screw consumers by giving them less choice in how and where they can buy a product. With figures in particular, exclusives are usually sold via mail-order or Internet sites that refuse to ship outside of Japan, which means foreign buyers have to fork out extra to buy the item at auction or through a proxy. Thankfully, ToysLogic seems to have an arrangement where they can get some of the Hobby Japan exclusives and that’s how I got my Jubei. This entry was posted in Figures, Reviews and tagged 1/8 scale, Alter, Hobby Japan, Hyakka Ryouran: Samurai Girls, Swimsuit, Yagyu Jubei. Bookmark the permalink. AS a beginning collector, I’m torn between the red or white version. Which one would you personally “recommend”? I prefer the red version. Swimsuits are designed to draw attention and the red version does a better job of this because its shade provides more contrast against Jubei’s skin than the white variant, which is too subtle for my tastes. 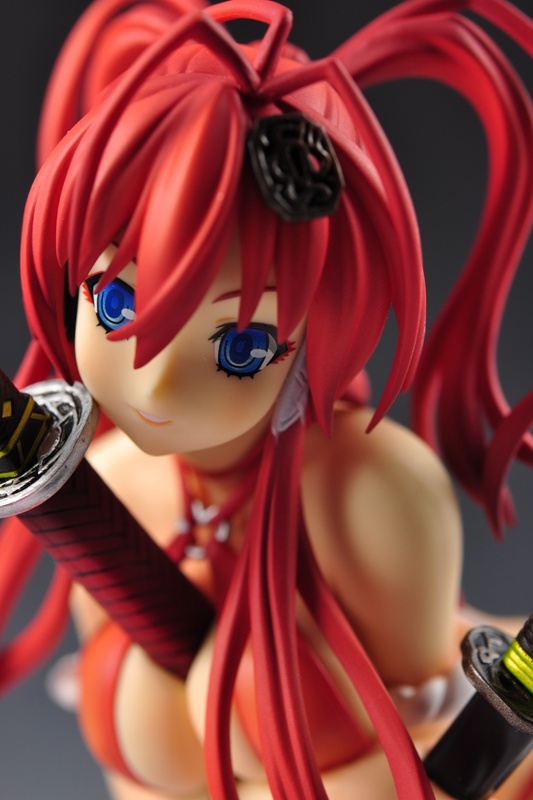 On the other hand, one could argue that the red swimsuit lacks contrast when compared to Jubei’s hair, which, when combined with the bright red display base, kind of pushes the figure into red overdrive. The white version is more balanced in this regard. I believe the white version can be had for a little bit cheaper (¥2,000 or so) than the red version, but they’re fairly close in price. The red version used to be much more expensive prior to the release of the white version, so now’s a pretty good time to be a buyer. I don’t think you can go too wrong either way. If you haven’t already done so, check out Tier’s review of the white version over at Tentacle Armada (see the pingback just above your comment). He’s posted some great photos of the figure that should give you a good idea of what the white swimsuit variant has to offer.